Both teams currently sit in the relegation zone heading into Round 28 with the Students seven points from safety while Esher are one point further back and at the bottom of the division. With tough fixtures to come as the season draws to a conclusion, a victory for either side on Saturday could prove vital if they are to survive relegation this term. Fellow strugglers Caldy are six points shy of safety as things stand and the Wirral outfit travel to sixth-placed Darlington Mowden Park while Cambridge, who sit just above the bottom three, visit Rosslyn Park this weekend. At the top, the title race enters its latest chapter as league leaders Ampthill and District take on Birmingham Moseley. The A’s are four points clear of second-placed Old Elthamains and Gavin Lach’s side host Cinderford in Round 28. Elsewhere in National One, Blackheath face Chinnor, Rotherham Titans entertain an in-form Bishop’s Stortford and Plymouth Albion go to Sale FC. Ampthill and District Director of Rugby Mark Lavery described last week’s huge clash with Rosslyn Park as a ‘banana skin’ that could have ruined 10 years of hard work, but the National One league leaders did not slip up. At one stage, their promotion hopes were up in the air as they trailed 20-0, but the A’s showed their class to rescue a victory which keeps them in control of their own destiny. With three games to go, the Bedfordshire side are in pole position to win the title and create a new piece of club history. Ampthill are four points clear at the summit and can’t be crowned champions this weekend, but can take another step towards glory when they travel to Birmingham Moseley. The hosts may have lost to Plymouth Albion last weekend, but their form over the last month has put them in a very positive position to avoid relegation. Three wins from their last four matches means the Midlands club sit seven points clear of the drop and a victory at Billesley Common on Saturday may well be enough for Richard Protherough’s side to secure their status in National One. After their defeat to Ampthill and District in Round 25, it would have been easy for Old Elthamians to feel sorry for themselves after being knocked off top spot, but Gavin Lach’s side have shown their class over the last couple of weeks. OEs are still firmly in this title race and comfortable wins over Cambridge and Caldy means they sit just four points behind the league leaders as we begin the final month of the campaign. As Ampthill failed to secure a bonus-point last week, OEs have just exerted a little bit more pressure on the table toppers and they can continue doing just that when they host Cinderford on Saturday. The visitors to College Meadow ended March with an excellent win over Rotherham Titans and a top eight finish is still realistic in their first season back in National One. Paul Morris’ side haven’t won away from home since the middle of January so if Cinderford were to triumph on the road in Round 28, it would certainly have an impact on the summit of the division. At half-time in the sunshine in Bedfordshire, Rosslyn Park were in dreamland as they were 20-0 up against league leaders Ampthill and their aspirations of the Championship were very much alive. However, the table toppers struck back in the second-half as a thoroughly entertaining contest went in Ampthill’s favour while Park’s title hopes suffered a major blow. Kieran Power’s side are now nine points off the summit with three games left to play and their fate is now out of their hands. Nevertheless, this quality Park outfit will continue to fight until it is mathematically impossible to win the league and up next for the London-based side is a fixture with Cambridge. The Blood and Sand will arrive in the capital in good spirits after a morale boosting win over Darlington Mowden Park in Round 27. Richie Williams’ men are now six points clear of the drop zone and a positive outcome at the Rock this weekend could secure their survival if other results also go their way. Following a run of five straight wins, there may have been some Blackheath supporters who still had a feeling that ‘Club’ could gate-crash the National One title race but last week’s loss to Bishop’s Stortford has all but ended any lingering promotion hopes. James Shanahan’s side are now 13 points behind Ampthill, but the men from Well Hall have had another very strong season in National One. The fourth-placed side have been embroiled in the battle towards the top for the majority of the season and at one stage, they were fighting alongside Chinnor. Their opponents on Saturday are coming to the end of their maiden campaign in this division and Matt Williams’ side have certainly impressed in the third tier. The Black and Whites are already planning for next season in National One, with the signing of Nick Selway catching the eye, but Chinnor will be hoping to end this current term on a high after a run of just two wins from their last 10 games. Last week’s defeat to Cinderford arguably summed up Rotherham Titans’ season in National One. After coming down from the Championship, it seems as though the Yorkshire club have taken one step forwards and two steps back for large chunks of this campaign. Following successive wins over Cambridge and Caldy, the Titans lost in Gloucestershire in Round 27 which slightly dented their chances of a top six finish. On the flip side, this is a young squad which Joe Barker has assembled and they will be keen to end the season in a positive manner as they look to continue building towards the second tier. As we begin April, they welcome Bishop’s Stortford to Clifton Lane who won’t want this season to end. Since the turn of the year, Andy Long’s side have been sensational and they travel north on Saturday having won nine of their last 10 matches. Their scintillating form has transformed Stortford from relegation candidates to top eight hopefuls and with confidence oozing, they will fancy stretching their winning streak to five games this weekend. It has been a very strong month for Plymouth Albion. In fact, Kieran Hallett’s side have looked like the Albion of old since the beginning of 2019 and their performances in the second half of the season have lifted them away from the bottom three and now into the top six of National One. Last week, Plymouth produced a clinical display to secure their seventh home win in a row against Birmingham Moseley and the men from Brickfields will be remaining focused as the season draws to a conclusion. Albion will now be keen to recapture some success on the road having lost their last three matches away from home, but a visit to Sale FC is never easy. The last five wins for Jonathan Keep’s side have all come at the CorpAcq Stadium and they will be hoping for some more home comforts in Round 28 as they look to keep themselves above the relegation zone. Following their disappointing loss to bottom of the table Esher last week, Sale are now 11 points clear of the drop zone so if they can match or better relegation-threatened Caldy’s result on Saturday, the Manchester-based club will be plying their trade in National One next term. Darlington Mowden Park suffered a tough afternoon against Cambridge last Saturday. Danny Brown’s side were hampered by injury and their own indiscipline at Volac Park and it led to DMP being outclassed by the Blood and Sand in Round 27. The North-East outfit had a March to forget following three defeats from four matches so they will be targeting a first victory for over a month when they host Caldy on Saturday. The Wirral side arrive at the Northern Echo Arena with time running out. Just two wins from their last 14 games has seen Caldy slide towards the trapdoor and as they enter Round 28, they sit six points shy of safety. With Rosslyn Park to come next week and Birmingham Moseley to conclude the season, Caldy will be keen for a positive outcome on Saturday and a repeat of their 14-8 win over DMP back in December could prove vital. What a result and performance it was by Loughborough Students in Round 27. A brilliant second half display away at Chinnor saw the Midlands club seal their second win from their last three games and their hopes of escaping relegation are still alive. The only factor which dampened the Students’ win last Saturday was the fact Cambridge also won which means Loughborough sit seven points from safety with three games to go. **BREAKING ** Director of Rugby & Coach announcement. Loughborough can be relegated this weekend if results go against them, but they have a real opportunity to enhance their survival hopes when they take on rivals Esher. The away side currently sit bottom of the table but like their hosts, the Surrey-based club picked up a crucial win in Round 27. Tom Williams’ side defeated Sale FC and now they are eight points off safety. 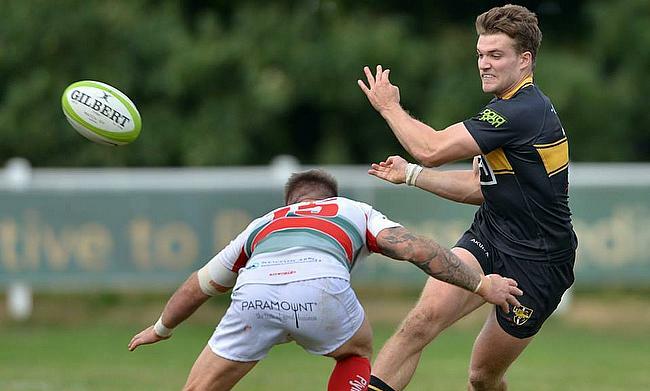 With Chinnor and Blackheath left to play after this weekend, Esher may have to come away from the Midlands with nothing less than a victory if they are to avoid the drop from National One.